A few days ago, the Ottawa Citizen ran the opinion piece “Demolish the Queensway” by Jonathan McLeod. In it, he posits that once we have a working LRT and have finished connecting the bits in the south to create a usable ring road, we should tear down the Queensway and make the space more people-friendly. When I first read the piece, it was with skepticism; where would all those cars go? But I began to see the beauty of it. Think about Phase 2 of the LRT: It doesn’t satisfy Kanata, as one of our electoral hopefuls can’t help himself but point out at every opportunity, but it covers much of the rest of the city. The Confederation Line website states that the trip from Tunney’s to Blair will take less than 24 minutes and covers 12.5 km and thirteen stations. If we extrapolate those numbers to the rest of the system, the 7 km trip from Bayshore to Tunney’s would take 13 minutes. Place D’Orleans is another 10 km from Blair, so another 18 minutes, but there’s only four stops so let’s make that 13 minutes as well. So, 50 minutes from one end of town to the other, rush hour or not, snowing or not. In comparison, Google Maps claims 28 minutes by car from my place with no traffic. Last time I went to Place D’Orleans to see a show at 8pm, it took me almost an hour. Sure, getting rid of the Queensway would be a shock, but the negative pressure would send people on other routes, including mass transit. Add the ring road. Make a viable connection to the Quebec highways so transport trucks don’t have unnecessarily drive into town. Complete Phase 2 of the LRT. Make Phase 3 replace the Queensway from Stittsville to Lees, and extend from Bowesville station to Baseline via Barrhaven. Other roads still exist. I have friends in the west end that already won’t touch the highway during rush hour since it’s a crapshoot when they’re going to get into the office, so they drive down Baseline, Carling, Hunt Club, anything. These roads will still exist for those that absolutely cannot fathom not having their car, and a smaller road can still exist beside the LRT, along, of course, with cycle tracks. But the point is that taking public transit, walking, and cycling should become the default when the highway is no longer there. It’ll be easier. It’ll be faster. “What about all the work that’s been put into the Queensway lately?” you ask. I’m not suggesting we tear it down tomorrow. The infrastructure isn’t there. This is a Phase 3 task. Phase 3, if you listen to anyone who isn’t Matt Muirhead, is 2031. The highway will need work again by then, but we can reuse some of the bits that have been put in recently, like the bridges that have been replaced, if we don’t want everything at grade. Personally, I don’t think we should do this, as it would limit the possibilities of what could be done with the space. The Queensway currently sees (by currently, of course, I mean in 2010 since those are the numbers that are available) roughly 160k cars a day in both directions. Split that in two for east and west, and two again for morning and evening rush hour as we all know that there’s never any traffic after rush hour is done, and we have the need to move 40k cars in each direction. Some of those will go on the ring road, since it’d be more convenient, some will throw their arms up in the air and actually move to a neighbourhood closer to their job. Let’s say we don’t, or the number of cars we shunt off brings us back to the 2010 numbers. Over a two-hour rush, we’d have 20k per hour, or roughly 21k people. Look around you next rush hour. Not a lot of car pooling going on. The Calgary LRT, which operates in similar conditions to which ours will, states that its 4-car trains, with the same capacities the O-Train have been touting, will practicably carry roughly 20k per hour. That’s almost everybody. And that’s not the only train running. With this third line, almost everyone in the city would be served. Having a reliable transit option is a real game changer. I grew up with car culture in the West Island of Montreal, mostly because the bus service out in “the boonies” where I lived was laughable. Heaven forbid you had to stay late at school, that meant one milk-run followed by a missed connection followed by another milk-run. Band practice until 4pm meant I was home at 6pm some nights. So I took my driving exam as soon as I could and pretty much took over driving responsibilities from my mum, mostly so I could have her car whenever I needed it. When I moved to Cote-des-Neiges, I took it with me, since she had given up her license. Driving in town was aggravating. I could never find parking. If we took it out for some reason or another, I’d sometimes have to park it two blocks away, but I’d have to move it before rush hour, lest it get towed. It was a liability. I had to move it when the snow plow came, lest it get towed. I had to make sure it was still not broken into. I had to use it every once in a while to make sure it didn’t rot on the street. And, on top of all of this, I didn’t need it anymore. The buses worked. The metro was a fifteen minute walk from my apartment. If I didn’t want to take the blue line, I could hop on a bus that would take me to the green line in ten minutes. From there I could get anywhere in the city, fast as you like. This is what I imagine the future of commuting in this city could be as well, but with the suburbs reaping the benefits as well as the core. With stations covering most of the population, a well-used LRT could pay for itself, and allow the bus network to thrive with the added transit funds. Any LRT stop would be a ten minute bus ride or less. Ottawa would be ready to face the future (hint: oil), get people where they want to get to conveniently and easily, and reap the benefits of reasonable rush-hour commutes. One thing I think the article got wrong: The Queensway didn’t cut neighbourhoods in half, the railroad did. The highway follows an old CNR right of way that was operational from at least the 1870’s pretty much up until they poured the concrete in the early 60’s. 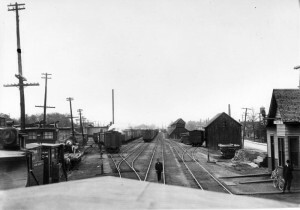 There used to be a rail-yard between Bronson and Bank, separating, as McLeod says in the opinion piece, the downtown core from its neighbours. I say put the tracks back, with a Complete Street beside them, and I think you might make everyone happy. Everyone except, of course, all the “your stupid” commenters on the Citizen page. They’ll never be happy. View from Bank Street towards Bronson taken in June 1910. Catherine St. just visible on the right. From Colin Churcher’s Railway Pages. Click photo for more information.